Preserved lemons; or, genetic memories calling? 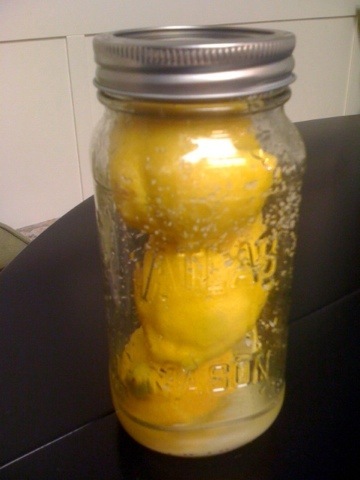 I’m preserving lemons even as I write. It is a work in progress. Yesterday I satisfied my inner Martha Stewart with a home kitchen exercise that fulfilled multiple needs at once. The prep work for making preserved lemons is ridiculously fast and simple. But as the process itself takes about three weeks of wait time, the jar of lemons sitting in plain view all that time on my kitchen counter, it feels like I’m engaged in a much more complex endeavor. And the result, three lemons, so beautifully softened by kosher salt and time, can be stored in the fridge for up to a year. Nice! I’ll have a lengthy period of time to enjoy the fruits of my labors. Let me tell you how intense those labors were. It all began with a beautiful image of these lemons on a food blog. The accompanying text promised flavor so luscious, so bright, so wonderful…well, I was inspired to put my hands on a Mason jar and buy some new lids to try this at once. There isn’t really even a recipe. You just choose the size jar you want to use, select a few lemons (I used three); you wash and quarter the lemons, slicing not quite through with each cut, so that the pieces stay attached. Then you fill the cut areas with kosher salt, stuff the lemons into the canning jar, and put a lid on. You don’t even have to go through a sterilizing process, just run the jar and the lid through the dishwasher before using. I did add a little extra salt on top of the last lemon, following the well known, “if a little is good, a lot is better” philosophy. That’s it. Now I just wait for the magic to happen. Supposedly, in the next three weeks, the lemons will soften, and their flavor, enhanced by the salt, will intensify. You can use slivers of the lemon rind in salads, or add slices to roasting meat, or find your own unique ways to utilize your bounty. Already, overnight, the lemons have released some of their juices; a small amount of liquid has pooled at the base of the jar. I understand that lemon-watching can become quite an obsession during this period, requiring regular checks to see what they’ve done overnight, or since I left for work, or between dinner and bedtime…you get the idea. I’m going to have a regular entertainment center on my counter! I’m looking forward to trying these in my favorite lemony recipes. But the preserves are just the bonus. The real joy in this is that I’m feeding some need within myself to be domestic, beyond home-cooked meals and laundry processing. I don’t understand where it comes from. I’m not even aware the need is there. Until I see something like this blog post, and I’m fired with an intense desire to can, or preserve, or somehow participate in the time-honored arts of a farm kitchen. Really, if I believed in genetic memory, I would think I’m experiencing the combined promptings of grandmothers, great-grandmothers, and all sorts of extended kin, who were queens of the garden: canning, freezing, making jams and pickles all summer. Like the little red hen, immortalized in the story of an industrious chicken who works for her chicks, my ancestors were not corporate ladder-climbers. But they worked, none the less. It would even be safe to say they were driven: growing, harvesting and processing all season long. As a child, my summers were blighted with never-ending buckets of black-eyed peas, butter beans, and worst of all, lady peas, those tiny peas that require HOURS of shelling to produce a “mess” of peas large enough to be worth cooking. My siblings and I shelled, and shelled, and shelled some more. Then I grew up and left home, and I don’t think I’ve shelled anything since. I’ve dabbled in flower gardening, actually grown a few tomatoes and herbs. This year I grew a pot of lettuce, and I have a pot of rosemary. My prize outdoor edible is a rhubarb plant. I love to harvest the stalks and chop up quantities to freeze for winter cobblers and pies. That’s pretty satisfying. But there’s something about canning…don’t know what it is. Mind you, I don’t really want to go whole hog. I don’t want to invest in home canning operations or stockpile jars. But now and then, a little freezer jam, or this find…preserved lemons…that seems just about right for me. I get all of the pleasure of anticipating jars of produce, thriftily and skillfully (!) stored for later use, without the intense labor of serious canning. My next effort at this type of kitchen magic is making my own vanilla. Found a recipe (same thing, you just split vanilla beans open, add a good quality vodka, and wait for the liquid to darken). Simplicity in itself! The particular charm here is the beautiful jars I’ve found for vanilla storage. I have to admit, that’s the real hook of this experiment. I have a long-standing clear glass fetish love of clear glass, and cool bottles always call to me. Check out this company: see my find? You can order in bulk, or buy one bottle at a time. How fun is that?! But more on this later, when my bottles have arrived and I’ve completed my commitment to the lemons. As an adult, I turned to people like Martha Stewart for inspiration. She gardens more elegantly than my family members did, I have to give her that. When Martha is in her garden, she looks invitingly rustic, never seems to break a sweat, or even get very dirty; and she always has interesting tools, perfect rows of plants, or wonderful raised planter boxes, no doubt designed by an upscale firm specializing in agricultural architecture. Martha changed my view of gardening. It went from something decidedly un-glamorous to a skill to be proud of, or at least interested in. Thus my move from reluctant child pea-sheller to an adult, able to appreciate the pleasure of having home-grown produce. I’m happy to say that for many years now, I’ve appreciated the talent and skill that I was dismissive of when I was younger. It seemed a given at the time. Didn’t everyone’s grandmothers garden and can? Well, maybe there is something to genetic memory. Or at least the inspiration that comes from memories of seeing the hard work and skill that generations of women put into feeding families. Martha made it cool to be in the kitchen, to have my own domestic skills. But my grandmothers made it real for me. I can close my eyes and see rows of finished cans of beans lined up on the counter, or freezer bags full of corn, cooling, waiting to be tucked away for a winter meal. Hmmm…wonder what else I can preserve in salt…or vodka…I might be on to a whole new thing. And if it’s a good thing (thank you, Martha! ), some lucky ones of you might be getting these as Christmas happys. We’ll know in about three weeks. In the meantime, if you’re wondering, I’ll be perched at my kitchen counter, watching the magic unfold in slow motion. I and my friends came examining the nice tips and hints located on your website and all of a sudden developed an awful suspicion I had not expressed respect to the site owner for them. The women happened to be certainly passionate to read all of them and now have certainly been taking advantage of those things. Thanks for being so helpful and also for picking out variety of great areas most people are really eager to be aware of. Our own honest regret for not expressing appreciation to sooner. Thank you for visiting and reading! I appreciate your comment, and please visit often! I think we are all born with an instict to preserve life, preserving food during a time of plenty for a time of lean is deeply ingrained in all of us. Most people just don’t take the time to realise it. Store up all you can because its going to be worth it in the future. And you might look into canning a few beans, peas, corn, & tomatoes. Nothing is more gorgeous lined up on your kitchen counter. PICKLES! That’s something you could enjoy making. I really wish you lived closer, we could have so much fun! I’m thinking about doing a couple of jars of lemons now, and I’m seriously going to make my on vanilla. What ELSE can we come up with? I’m eager to go with you on this exploratory journey! Especially since it doesn’t require boiling water! With all this heat I don’t relish heating up my kitchen any more than necessary.